With this being Valentine's Day, I know some of you may be planning a lovely dinner to eat in. In Chapter 12 of Tracey's book, Frugal Luxuries, she speaks of serving food in order to dine, not just to eat for mere survival. Therefore, today especially, plan to set a table that is as lovely to look at as the food is to eat. Consider using a tablecloth, perhaps a vintage one (I found a beautiful one for $1 at our local Goodwill) or perhaps your heirloom one that you never get out! Use cloth napkins for a real feel of elegance. A fun way to decorate your table is to make custom napkin rings. Use copper cookie cutters in heart shapes to slip your napkin into or cut a length of coordinating ribbon to tie a simple bow around your napkin. Take a piece of floral wire and thread beads and charms on it, twisting the wire in the back of the napkin so it doesn't show. Cut 1 inch slices of a paper towel tube and cover it with wrapping paper that suits the holiday. Slip your napkin into the ring. You can also wrap these slices with ribbon to create yet another effect. 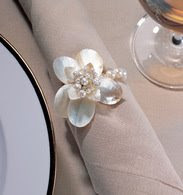 Use a vintage pin by hot gluing it to an existing napkin ring. It adds a little glitz to the table! Your centerpiece should reflect the mood of the event. An Italian meal might have a enterpiece of a Chianti wine bottle with a candle in the neck, with beaded fruit around it. Crystal candleholders with silver trinkets surrounding it gives off some beautiful glow. A small arrangement of flowers surrounding by candles in votive glasses might be the very thing! 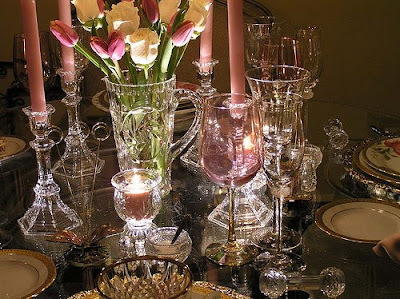 Using glass stemware is always a way to make your table beautiful. If you want a formal setting, use stemware or glassware that matches. Otherwise, create an interesting and fun table by using mixed designs. And by all means, do not underestimate the use of a candle! I know I mentioned it earlier, but the soft flickering light reflecting from your dishes and crystal is so very helpful in creating a mood. Background music, soft, of course, is the perfect layer for the atmosphere you are creating! A quick word about dishes... a set of white dishes, china, corelle, stoneware, pottery... always a good investment. Restaurants like to use white dinnerware as it accents the food. You can mix in and match up your dessert and salad plates (this is how I get many of my table settings...) to add color! Go check out all the posts on Tablescape Thursday here. You will gain a huge number of ideas just by looking at these posts! Terri, how lovely and such good pointers. Thanks! Great tips for a festive table Terri. Thanks and enjoy the day! Beautiful setting. Wow, you have this going on girl. It might even make my planned dinner hotdogs taste better (j/k) I'm gonna make Steve take me out. Happy Valentines Day. Perfectly romantic! Happy Valentine's Day! Great pointers to celebrate a romantic Valentines Day on a budget. Loved seeing the photo from Judith @ Sweet Designs. She for sure can put together an unbelievable table. I love looking at everyone's table scape setting as it would take me weeks to set up just one! Love the post and thank you for the tips! Happy Valentine's Day! Hello there Bob and Terri! Have a wonderful, romantic and loving day together! Happy Valentine's Day. Cute post! You gave a lot of good advice. Valentine's Day can be so nice if you make it that way. Have a nice one. Simply gorgeous. I love the ideas you shared. ...and yes, responding to your comment, I think Barb is a wonderfully sweet lady. She is a very involved blogger already. The table setting looks beautiful! I agree, a set of white dishes is always a good investment. What great suggestions. After a busy two weeks with family and friends visiting from out of state (and the requisite trips around a rainy southern California :) I am so glad to be getting back on schedule at home and the chance to catch up on your blog! I'm off to read more of your past posts! Oh, you and Bob look adorable all dressed up!! P.S. Thank you so much for the nice mention of the book! You are so kind.